I spoke last week about my love for John Currence's new book, Pickles, Pigs & Whiskey. It is filled with lively southern staples such as pan fried catfish and corn and red pepper chowchow, but all with his expertise. When flipping through the book, this recipe caught my eye. It reminded me of my Grandmother's wilted lettuce, iceberg lettuce with a warm bacon vinaigrette, which she always served alongside a roast for big family meals. This is definitely a more upscale version of wilted lettuce, but it still has all the richness and warmth of a warm vinaigrette. 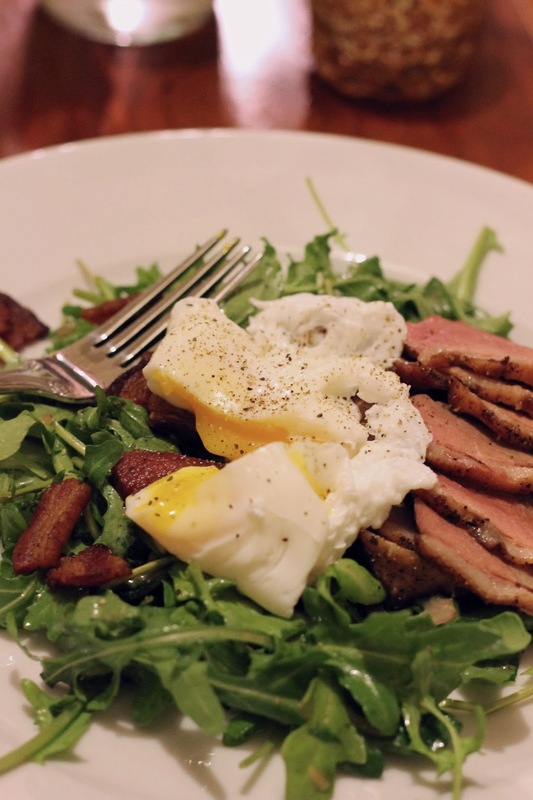 This salad is perfect for a cold night, when you feel like you need a salad, but still want something comforting. Preheat oven to 425 degrees. Heat a cast-iron skillet over medium-high heat. Add the diced bacon and cook until crispy. Remove the bacon with a slotted spoon and place on a plate lined with paper towels to cool. For the vinaigrette, combine extra-virgin olive oil, red wine vinegar, dijon mustard, mined shallot, and salt and pepper. Whisk until emulsified and set aside. Season the duck liberally with salt and pepper. 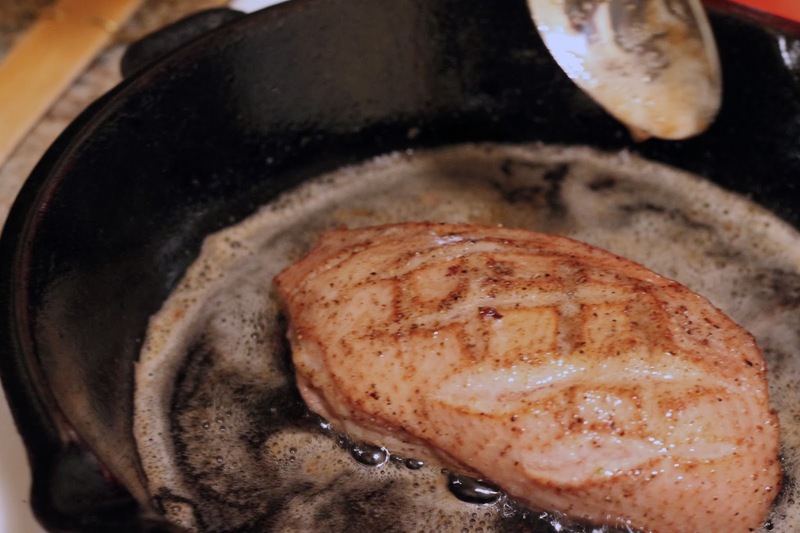 Place the duck breast, fat side down, in the cast-iron skillet coated with bacon grease. Cook over medium heat until both sides are slightly browned. Then, lower the heat to medium low and spoon the fat over the breasts for about 5 minutes until nicely browned. Transfer the skillet to the preheated oven and cook for 6 to 8 minutes. The breasts should reach and internal temperature of 125 F. Allow the breast to cool for 10 minutes. 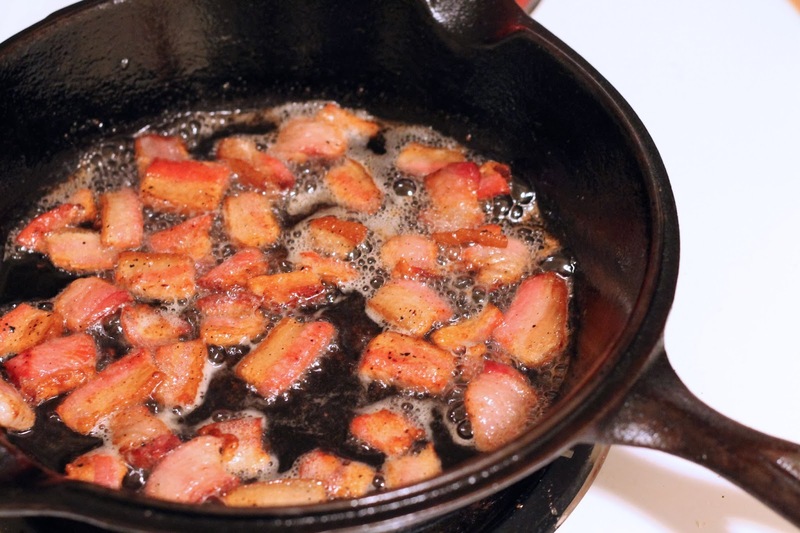 Remove any excess grease from the skillet. Pour the vinaigrette in the warm skillet and allow to slightly cook. Then, toss the vinaigrette over the the arugula and shallots. 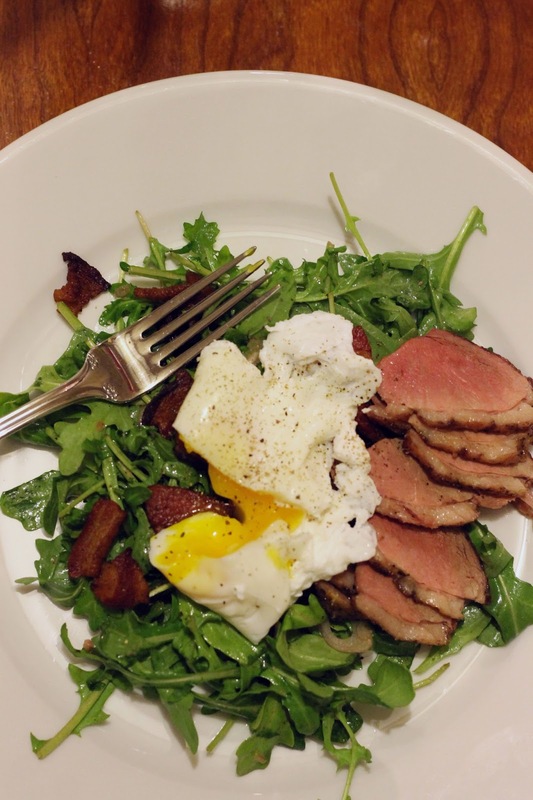 The vinaigrette will slightly wilt the arugula. Bring a large sauce with 4 quarts water with addition of white wine vinegar to a simmer over medium-low heat. Carefully drop an egg in the center of the pot. The egg will separate, but should come together naturally. Cook for about 2 minutes until the whites are opaque. Remove from pot with a slotted spoon and place on a paper towel to dry. Repeat with remaining egg. To assemble the salad, place arugula and shallots on a large plate. Once the duck breast has cooled, slice on a diagonal and place half on each plate. Top with a poached egg and sprinkle with salt and pepper.